The World as known to the Ancients. 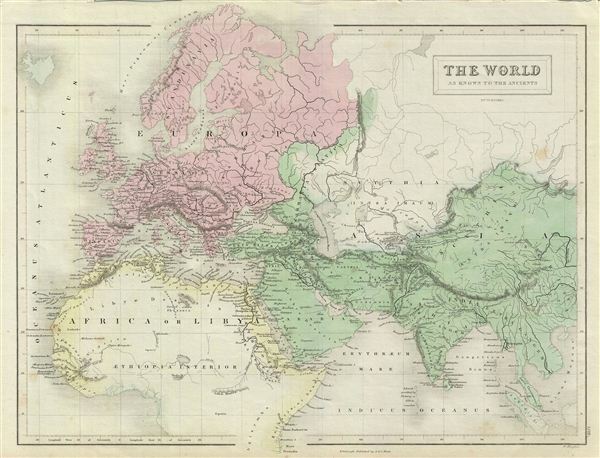 A fine example of Adam and Charles Black's 1851 map of the world of the Roman empire. The map covers the span of world as known to the ancient Romans, from the Scandinavia south, as far as Sumatra. Includes all of europe, Arabia, part of Asia including the Indian subcontinent and part of Africa. The empire was established in 27 BC after Gaius Julius Caesar Octavianus, the grandnephew and heir of Julius Caesar was awarded the honorific title of Augustus. During the time of the empire, Roman cities flourished. Trade spread as far as India, Russia, China and Southeast Asia. However, the sheer size of the empire and its success also contributed to its downfall. The Western Roman empire collapsed in AD 476, when Romulus Augustulus was deposed by the German Odovacer. The eastern Roman empire, evolving into the Byzantine empire, survived until the Ottoman Turks captured Constantinople in 1453. Throughout, the map identifies various cities, towns, rivers and an assortment of additional topographical details. Map is hand colored in pink and green pastels to define boundaries. The map is engraved by W. Hughes and issued as plate no. LVIII in the 1851 edition of Black's General Atlas. Rumsey 2305.070 (1854 edition). Philips (atlases) 4334.